Jelly Belly Nonsense: WHAT A GAME! DAMN I missed it !! BAs after Reggie Left :~(, the NBA is not worth watching..
congrats jelly .. 7asafat pacers bas although they didn't play that well .. i still have hope next season with artest back.. Indeed a great game. 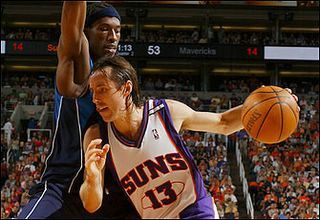 Now did you see the difference between Nash and Nowitzki in terms of leadership? Did you see how Dirk went nuts at the end of regulation yelling and screaming. Screaming at whome? Jason Terry, who's without his 36 points, this game may have been over even before the 4th quarter. Dirk bores me to death and day by day proves to me he's not any where near the elite. He's a good shooter. That's pretty much it. A team with Ginobli never loses!